Cherry Koo has been serving with Hongkong Jet since 2013, and is currently employed in the position of Financial Controller. She has an incredibly conscientious personality, with a high degree of professionalism. She currently leads a dedicated team of Accounting Executives servicing our entire company accounts. 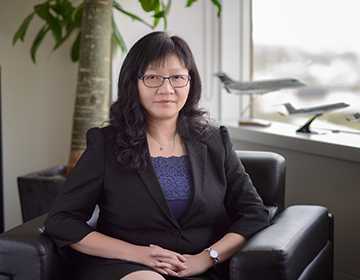 When joining Hongkong Jet, Cherry brought with her more than 25 years of accounting experience and a varied career spanning from private owned, non-profit making organizations, to professional firms like Tricor Services Ltd (the biggest accounting and company secretary service provider in Hong Kong) and KCS Ltd.
Cherry has a Bachelor degree of Commerce, Major in Accounting and Finance from the Curtin University of Technology, and is a Fellow member of ACCA and mentor to ACCA members since 2005. In her leisure time, Cherry enjoys Yum Cha with her family and hiking around Hong Kong.